Being a photographer myself, and having worked for a magazine company buying photographs, I've always been interested in photographers and their work. This little book highlights those whose work was out there way before the Internet where there is now a glut of photographs wherever you look. The photographers featured here are legendary artists who continue to inspire decades after their work was first seen. Some photos have even become classics, such as Eve Arnold's photos of Marilyn Monroe. Nowadays, a generation will grow up never having seen or used a film camera, just a digital one. I've done both and just love the advances the digital age has made. It's inexpensive, easy to use, has greatly advanced equipment, and on and on, and I have to marvel at how the earlier photographer made his craft work without the convenience we enjoy today. Author Dickie gives us the beginnings of photography, starting way back in the 1820s, and how pictures were fixed on paper and plates. This was back in the days of Louis Jacques Mandé Daguerre and William Henry Fox Talbot (the negative), the Lumière Brothers, and George Eastman (inventor of the Kodak camera). 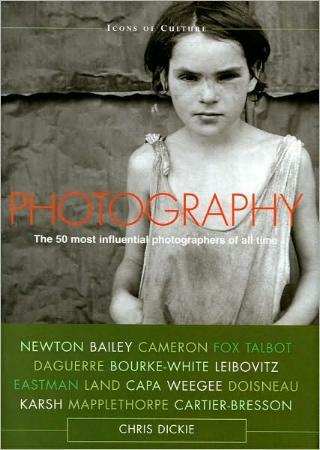 Margaret-Bourke White, Henri Cartier-Bresson, Helmut Newton, Karsh, Diane Arbus, Robert Mapplethorpe, Annie Leibovitz, Cecil Beaton, Richard Avedon, David Bailey, and of course Ansel Adams are among many others included in the 50 featured photographers in this book. There are many photographers I'd not heard of and whose history and backgrounds were very interesting. Some did landscape work, others portraits, some fashion, celebrities, nudes, erotica, you name it. Conclusion - Extremely interesting and eye-opening.